I am not what one may call a “cook”, I love to bake and I love to watch Andrew cook haha! But on a daily basis I do a lot of “prep” in our kitchen and a lot of cooking for Liam. I wrote a post a while back about the wedding gifts we use the most and a lot of this may be overlap, but I think it’s important especially almost 5 years into marriage and almost 6 years into living together to share the kitchen items we use the most. If you are looking to add to your kitchen or invest in a few items this may help! Mixing Bowls: This is one thing when I registered for I don’t think I realized how much it would get used! I am fairly certain I pull at least one of these out everyday for something. Vitamix: This was a gift that when we registered for I didn’t think anyone would get us. A family friend was super generous to get it for us and we use it EVERY SINGLE DAY! The 3 of us have green smoothies each evening and we’ve really gotten it’s moneys worth! Slow Cooker: I know so many people love the instant pot, but you know what it’s just not my thing. I love my slow cooker! We use it 2-3 times a week for chicken which is used for lunches, salads, etc. We use it for soups, chili, stew, and more during the winter months. We use it for shredded chicken for quesadillas and tacos. I mean it’s just the best. Also if you have one you need these liners. Automatic Salt and Pepper grinder: This is something I didn’t think we needed until we had it. My dad gave it to us as a house warming gift when we moved in together almost 6 years ago and we use it multiple times a day! Kitchenaid Mixer: So this is just what everyone registers for right? You pick a pretty color and think “won’t this look lovely in my kitchen.” Well we actually use ours! I use it a ton for baking and every Friday night Andrew uses it to make our pizza dough! We have home made pizza every Friday and it’s my favorite part of the week. We have a light blue one which I think looks great anywhere. Truth be told I wanted yellow for some reason and Andrew said no. I’m glad he vetoed that. Rice Cooker: When we got married Andrew already had a rice cooker but sadly about a year ago it died and we had to get a new one. We make at least one meal a week that involves rice and this one is fantastic! The one we have is under $30 and had about 10k good reviews on Amazon! Quality silverware/plates/glassware: We got our everyday plates and glasses from Crate and Barrel and purposely got ones that were quality but not expensive. We have had to replace the glasses a few times because someone (me) is not very gentle with putting things in the dishwasher. I also wanted ones that they would carry forever and not super trendy ones. This is a personal preference. For silverware this one the ONE item Andrew insisted we see in person, as he is very picky about them. Nice vases: I think having some really pretty nice vases is important. I tend to always have our flowers in the kitchen so that’s why I put it in the kitchen category! We were blessed to received a few nicer vases for our wedding or gifts and this one is my favorite. I try to use it as often as I possibly can. Good bakeware/silicon muffin liners: As I have mentioned I love love love baking! Especially muffins the last year or so. They are such an easy grab and go for breakfasts and snacks and Andrew and Liam both love them! This is the best bakeware set and for what you are getting and the quality the price is amazing. I also suggest grabbing silicone muffin liners. They involve very little clean up and keep your bakeware looking much nicer. I have the large and the mini sizes. 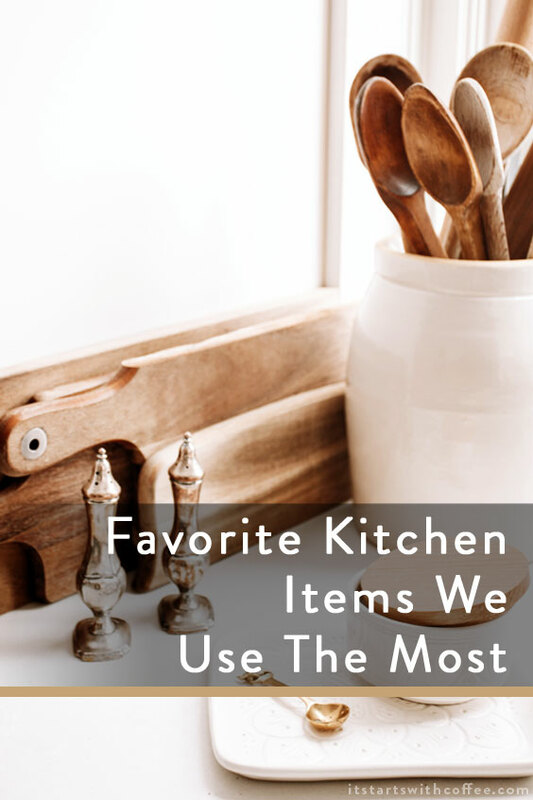 I could go on but these are the kitchen items we use the most, and I hope this helps you either know what may be missing or what you might need in the future. The only two I don’t have are the vitamix (but I do have a really good blender and the Magic Bullet) and the auto salt and pepper grinder. We hardly ever use salt, but I use a lot of pepper so can see how this would be handy. My stand mixer was the gift I put on the wedding registry thinking no one would purchase but my husband’s employers went together on the gift. So, I brought some of the first batch of cookies I ever made using it to his office. I hadn’t thought about getting good vases. That’s so helpful to have on hand! My vitamix and kitchenaid are definitely some of my best pruchases and I use them so often. They are definitely necessities! I joke that the best part of getting married was the Kitchen Aid mixer we received as a gift. It’s my favorite. The rice cooker is SUCH a lifesaver!! I love that it cooks rice perfectly every time! I love my slow cooker. It’s my most favorite kitchen utensil ever! I love the smell of my house when using it too. I really could use one of those better Vitamix machines. They would be so helpful with smoothies as well as some other things I would like to do like soups and such. Oh yes! Those kinds of stuff are my favorite too and I can not cook without them. Thanks for sharing this!